Em served as one of the first Venly Fellows after being nominated as a graduating college senior by two local chambers of commerce. Em’s longtime interests in social media, data analysis, local businesses, and organizational challenges, and team dynamics made the Fellowship a natural fit. Em grew up in Northfield, Minnesota where their father ran an independent grocery store and participated actively in the local chamber. Em worked through college focused on trend analysis as a Data Support Specialist for a local insurance company. Em played varsity soccer and graduated from Mount Holyoke College with a BA in Sociology. 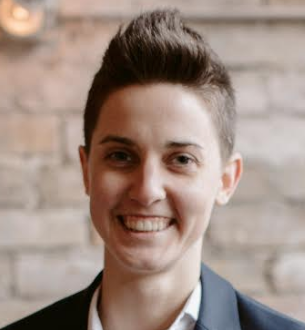 In 2019, Em returned to Venly after serving as a senior business analyst and operations management for Union Street Media, a cutting-edge provider of digital marketing services. At Union Street Media, Em specialized in business analysis and leading cross functional teams. As Venly’s Business Metrics Lead, Em supports all Venly clients, Fellows, and Coaches to accelerate their measurable growth. Em focuses on all four Venly business tracks to improve outreach & engagement, community commerce innovation & transactions, web-based operations, and cybersecurity. See below for a retrospective on Em's Fellowship year and a description of the cool job that came next.